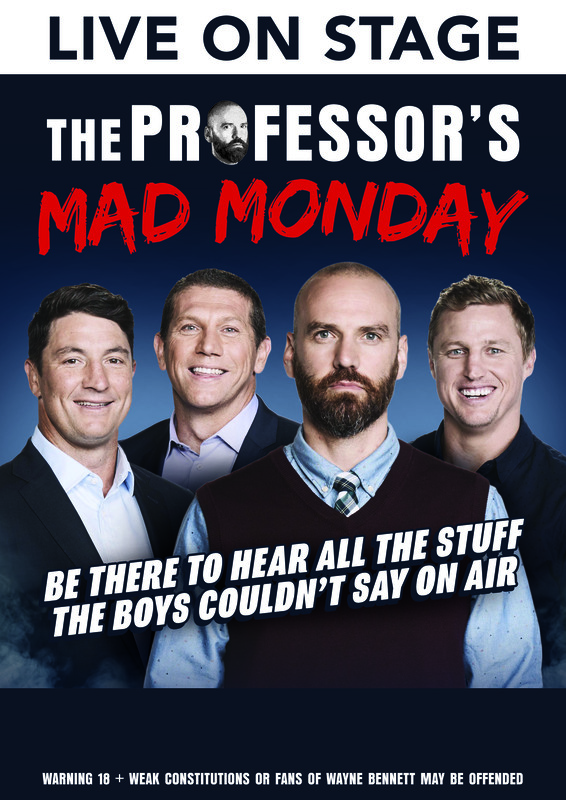 The Professors Mad Monday is all the stuff the boys weren’t allowed to show on Air. Its an over 18s show so people with a weak constitution or fans of Wayne Bennett may be offended. Don’t miss the Professor Live! James Rochford is a fake Professor who makes his living poking fun at men who are much more talented, athletic and larger than he is.No one would be surprised if one day a footballer put one on his chin. Nathan Hindmarsh is a Parramatta legend who has had hislegacy as a footballer ruined by working with The Professor. He has manystories as he played first grade games of Rugby League (330). When Bryan Fletcher left the NRL Premiers, The Roostersfor arch rivals The Rabbitohs, he was chasing cash, which is exactly why heagreed to be a part of this tour. Brett Finch is a veteran of five different clubs. He alsoplayed Rugby League for a bunch of different teams. He has a story and everyclub he ever drank at and every team he ever played for. Don’t miss The Professor Live! Legends, Laughs andLarrikins all on stage in one huge night of hilarity!